If capitalist ennui had a signature scent, it would be the smell of soft pretzels in an airport departure lounge. The hint of plastic in the baking dough. Butter a bit too yellow. Undertones of industrial cleaner. You smell it browsing a magazine rack of missiles, gleaming abdominals, and portraits of Kim Jong-un. You smell it as you settle by a window to watch the planes take off, as you imagine them flying from one hermetic building to another. Maybe you imagine, for an instant, that in some dystopian future these will be the only places we inhabit: sealed buildings scented with some fake artisanal past. I read much of Enlightenment Now in an airport lounge. From the title you might think it’s a self-help book. Had famous psycholinguist Steven Pinker found a shortcut to Nirvana? In my cloud of self-absorbed first-world angst, I was a bit disappointed that this Enlightenment refers to the philosophical movement of the 1700’s, which I remembered as having something to do with Kant and being less romantic than the Romantics who came after. It turns out I’m Pinker’s target reader. And so are you if you brace yourself when you open the morning paper, or close it thinking civilization has careened off a cliff. We don’t realize that things are better than they seem. “The Enlightenment principle that we can apply reason and sympathy to enhance human flourishing may seem obvious, trite, old-fashioned,” Pinker writes. “I wrote this book because I have come to realize that it is not.” And because the Enlightenment has few advocates. Pinker fears its quiet ideals may fade “into the background as a bland default” while “ideas like authoritarianism, tribalism, and magical thinking easily get the blood pumping.” Pinker doesn’t want us to go googly-eyed for the Enlightenment. Our passions can mislead us, and do: hear the drumbeat of Fascism in Eastern Europe, the anti-vaxxers, the Tweeters-In-Chief. That’s why Pinker pitches reason and humanism like one scientist to another, asking us to engage the capacity for rational thought Enlightenment thinkers said is there in all of us. 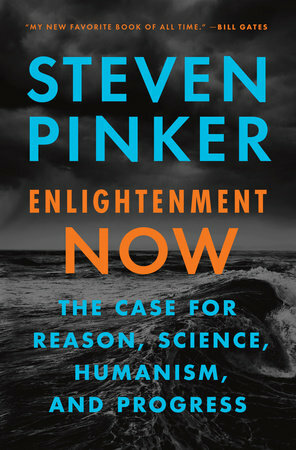 Pinker begins with his modern view of Enlightenment ideals, but turns quickly to the evidence for their success. A talented if domineering tour guide, he marches us through the extraordinary improvements to the human condition, from our increasing life spans, improved health and economic security to fuzzier measures like wellbeing and happiness. The book ends with an exhortation to stay on course: we can sail the H.M.S. Enlightenment into an ever more prosperous and peaceful future… if we plug our ears to “progressophobia,” tribalism, and other philosophical sirens. That Enlightenment ideals sound like limp axioms of human existence is a testament to their success. “The Scientific Revolution was revolutionary in a way that is hard to appreciate today.” Reason gave us a “paradigm of how to achieve reliable knowledge” about droughts and winds and the movement of animals; about our aches and ailments; about the flow of blood in the heart, or electricity in the brain. Until reason and science we lived a ” ‘kind of collective paranoia,’ ” making hazy sense of the world with superstition, religion, and hearsay. Science was revolutionary also because it implies that we tiny creatures on the margins of Nature might better our collective lot. Not by praying or sacrificing goats, but by methodically advancing technology to carve a pocket of order out of an indifferent world. Human progress is a modern idea, too. A professor of cognitive science at Harvard, Pinker admits that his “arcane technical knowledge” does not make him the most obvious author for this book. But one of Enlightenment Now‘s most powerful insights stems from his expertise in psychology: that when progress happens, we are wired not to believe it. With good reason. We are fragile beings, Pinker notes, subject to any number of misfortunes. We could trip down the subway stairs; an air conditioner could fall on our head; we could get food poisoning from bad sushi, or catch the flu when a toddler sneezes in our face at the store. But what could leave us better off? Winning the lottery? What’s more, Pinker notes, our memories enshrine special events but neglect the unremarkable. In lives driven by routine, these special events are often unpleasant. We remember the train delay that left us wedged in a stranger’s armpit for forty-five minutes, but not the hundreds of times the train got us to work on time. The media only magnifies this bias. “News is about things that happen, not things that don’t happen.” Good news is almost always the latter –a murder not committed, a war that doesn’t break out– while showy disasters keep viewers from changing the channel. The media has become more and more negative — Pinker cites the growing frequency of negative versus positive words in The New York Times — and more widespread. Thirty years ago the news updated us on the world’s woes twice a day. Now we can wallow in them 24/7. Why does this matter? Because our brains estimate probabilities with whatever pops easily to mind. If forced to guess, you’d probably say more English words start with k than have k as their third letter (which is actually far more common) because your “mind’s search engine…[retrieves] words based on their initial sounds.” These mental miscalculations lead “vacationers [to] stay out of the water … after they have seen Jaws” and leave many of us believing we’re more likely to die in an act of terrorism than choking on our food, though the latter is more than ten times as common. How do we overcome this cognitive handicap? Use numbers, Pinker says, and believe what they say. The numbers say things are getting better. That we are healthier, live longer, are much safer and richer than we were two centuries or even fifty years ago. That the global average lifespan is more than twice what it was for most of our history. That we are less likely to die of disease or in accidents. If nostalgia leads you to romanticize old New York, know that the “Brooklyn Dodgers … were named after the city’s pedestrians, famous for their skill in darting out of the way of hurtling street cars.” If each tragic house fire makes you think the city is burning down, know that the average American’s risk of dying by drowning or fire has decreased by more than 90% since 1900. We are also richer. There is more wealth to distribute among the world’s people, and technology makes that wealth go even further. What was once expensive is now cheap and more effective. Refrigeration used to mean a poorly insulated icebox with ice delivered only to the rich. Today it means a fridge. “‘Dental care’ in 1800 meant pliers and wooden dentures; in 2000 it meant Novocaine and implants.” And if these anecdotes ring too anecdotal, check out the seventy-plus graphs — each a numerical testament to the improvement of life on Earth. Pinker is a brilliant communicator. Each chapter features juicy anecdotes — like the tidbit about the Dodgers — to keep the most finicky reader entertained. Some, like the chapter about the environment, are fascinating policy papers (Pinker suggests a carbon tax and nuclear power). But the myriad graphs and three-hundred-some pages of evidence start to feel like a trek up Mt. Washington with an Eagle scout who just got his badge. Once we get there, this gargantuan volume isn’t an invitation to rest on our laurels. It’s a pep talk. Coach Pinker doesn’t ignore our setbacks. He bulldozes them. The Spanish flu and the Holocaust get their grisly due — as setbacks we’ve bested. Climate change represents a worrying threat, but reason and science could defuse it. Rising inequality in developed countries gets a nimble side step. According to Pinker, inequality is slippery to define and “not a dimension of human wellbeing.” After all, he notes, World War II razed inequality (and everything else), but didn’t make anyone particularly happy. Even in better times, studies have shown that perceived unfairness is the real downer, not inequality: poor people don’t mind the rich, as long as they have the opportunity to get rich themselves. “Opportunity,” of course, is tricky to define. Pinker notes that “in poor American neighborhoods, primary and secondary education are unconscionably substandard,” leaving poor Americans the right to pull on their proverbial bootstraps, but few bootstraps to actually grab. Still, I agree with Pinker’s suggestion that our educational system’s “not keeping up with the demands of modern economies” probably induces greater misery and dissatisfaction. If you think that the scientific wobbliness of inequality has little consequence, Pinker argues compellingly that this classic left-wing narrative “propelled the candidacy of Donald Trump.” In other words: “Ideas matter,” and the ideas floating in the intellectual troposphere have become more and more unreasonable. Pinker’s ire rains heavily on the “declinists” in the Ivory Tower. “Intellectual culture should strive to counteract our cognitive biases, but it too often reinforces them.” He lambasts scholars in the arts and humanities for turning students — including future world leaders — into science skeptics, who think of science as just another philosophical idea, not the measured pursuit of reason closing in on empirical truth. Pinker’s fiery tone, alas, seems unlikely to bring wayward Nietzsche-philes back into the fold. And the book’s dismissal of science-related sociology is a bit too flip. Pinker ridicules “science studies,” where scholars “devote their careers to recondite analyses of how the whole institution [of science] is just a pretext for oppression.” I think science is mostly a pretext for science, but that still leaves plenty of room for oppression. We scientists form our own little society, complete with social trends and hierarchies. If you’ve seen two hundred string theorists swarm the hors d’oeuvres at a conference, you’ll agree there’s plenty of anthropology to study. The anthropology is important: scientists have their share of irrational biases and #MeToo moments, all of which can get in the way of Pinker’s cherished scientific advances. Such strong Enlightenment blinders also mean that Pinker sometimes plows over subtleties in the data, engaging in the over-simplifying “root-causism” he rightly rails against. He provides little context for studies that find the Western world growing happier (the U.S. is a notable exception), though self-reported emotions are tricky beasts subject to cultural trends and experimental artifacts. Worse, when Western women are “outpaced by men” on the happiness front, this self-proclaimed “feminist-era husband” insists that we’ve become less cheery because today we also shoulder responsibilities outside the home, while in earlier days our “list of responsibilities rarely extended beyond the domestic sphere.” Sure, fulfilling your ambitions can be stressful, but I’d wager that doing most of the domestic chores while working full time–as a majority of women still do–is a bigger problem. Pinker advises us not to judge Enlightenment ideas by the flaws of their creators (some of whom, as denizens of the 18th century, were “sexists, racists, [and] slaveholders”). We shouldn’t judge Enlightenment Now by Pinker’s occasional condescension or misplaced phrase, either. His evidence for progress is overwhelming if circumstantial, his arguments compelling if occasionally blunt. In a world of almost eight billion, Pinker says, there are no simple problems, and no simple solutions. The Industrial Revolution sparked such growth in wealth and well-being — and so many new workplace hazards. We move forward by “unbundling” innovations, keeping their benefits while sanding down their flaws. Progress is imperfect, a chimera by default. We are capable of reason and blessed with “sympathy.” But we are also animals with itches, yearnings, aches and strivings. Viciousness, gentleness, love, desire. Where does that fit into our reason-built world? Pinker all but ignores the question. But the answer is there in every gorgeous graph, in every ardent analysis of human flourishing. Pour your passion into ‘why’s, not ‘how’s. Into eradicating diseases. Into cleaning the air and sea. Into eliminating misery. Your passion is the fuel. We already have an engine. It’s reason, and it works better than anything else. Sophia Domokos is managing editor of The Cooper Square Review.